The British. Anarchy & Rage. Oh, so true! – The British really know how to show their rage. Don’t ever push a Brit to the edge – They’ll end up having two cups (of tea). Now, if you came to this blog post wanting far more intellectual material regarding anarchy then you might like to find out more about becoming an anarchist. Oh yes – I have all the answers. I did a little random googling research and found the perfect site for all you wanna-be anarchists. How To Be An Anarchist has all the answers. The 13 steps will help anyone. Although I am sceptical about the fact that the ‘Things you’ll need’ list includes Intelligence…… Is that really necessary on the list? This entry was posted in Europe, Life, People, Random and tagged Anarchism, Anarchy, blog, British, England, English, Funny, Government, Humor, Humour, odd, politics, Random, tea, UK, United Kingdom by jamieonline. Bookmark the permalink. Don’t go for anarchy; go for rightful challenge in law. If you want to change the present way the British are governed; abolish the WHIPS in parliament; and demand rightful challenge in law. Violent protests against Government and Parliament in the streets achieves absolutely nothing, Both Government and Parliament just ignore them. Challenging the vicious cuts the Government has imposed, must be challenged, in LAW. All these silly organized protests, marches, and rally’s in the street are a complete waste of money and resources; And, they are a complete waste of time. It is time that the organizers of these protests, Unions, Student protests, etc etc; must turn their attention to LAW. The Supremacy of Parliament, as claimed by Parliament and, as is upheld by the Judiciary,relies for the legal validity of such claim upon the provisions of “Article 9” of the Bill of Rights 1689. But, what both Parliament and the Courts have ignored for the last 300 years plus, is that the application of all or any of the (Premises) “Articles” of the “Bill of Rights”; are, wholly, conditional upon, the provisions of, “The Said Rights Claimed”. This is another paragraph in the Bill of Rights, that makes it absolutely clear, in British Law, that in the application of any of the “Articles” in the Bill of Rights,: NOTHING SHOULD PREJUDICE THE PEOPLE. I am confident that very few people in the UK; have ever heard about this. Both Parliament and Government; and the British profession of LAW; have kept very quiet about this either because they did not know of it; or, that ‘vested interests’ required that it should not be widely known. If the British People were aware of it, and then realized the true implications of it, there would be a much better chance of the People challenging Parliament in the Courts… That is why the Judiciary, for all this time, has always denied the People’s right to challenge or question Parliament in the Courts; constantly quoting: “Article 9” for the reasons why. They want the British People to believe that LAW (Article 9) prevents challenge or questioning of Parliament in the Courts. I urge everyone in the country to check out a copy of the “Bill of Rights 1689” for themselves. (It can easily be found on the Internet). “The Said Rights Claimed” can be seen in the paragraph immediately following the listing of the 13 ‘rights’ parliament is claiming from the King. Look for “Article 9” then go the bottom of this list of all the “Articles” and just after the last “Article” listed, is, “The Said Rights Claimed”. “The Said Rights Claimed” specifically determines that in the application, by parliament, of any of the “Articles” in the Bill; that, NOTHING SHOULD PREJUDICE THE PEOPLE. The Offices, Procedures and Practices of the WHIPS in parliament; does ‘prejudice’ the People. Their activities supplant the electorates ‘influence’ upon their Members of Parliament. In a WHIPS instruction issued to Members of Parliament each week; the electorates ‘influence’ is supplanted by the diktat of the political parties in Parliament. This instruction is issued to Members of Parliament each week, in a document that is known as: a one, two, or three line party whip. Wholly illegal and proscribed by, “The Said rights Claimed”. The present CONDEM Coalition Government we now endure; likewise, is wholly illegal. It does, and, it has, ‘prejudiced’ the People. It’s very creation by the corrupt leaders of the political parties in Parliament, has ‘prejudiced’ the People. The numerical results of the General Election of 2010 made it abundantly clear that the declared intent of the British People was: that they did not wish to give any political party a ‘majority’ in Parliament. There were reasons for this; based on previous ‘expenses’ irregularities by Members of Parliament, the People, did not trust Parliament. These numerical results determined, that there should be a ‘minority government’. With DAVID CAMERON as Prime Minister; as the Conservative’s had the most elected Members in Parliament. But, the corrupt leaders of these political parties in parliament then determined that they didn’t need the People’s participation anymore. They, decided, that they could ignore the People’s wishes as declared by their vote; and, just like “Mafia Gangsters” they then proceeded to foist on the People of this country, a rotten and corrupt ‘coalition government’ that they did not choose. Holding a pistol to the heads of the entire electorate they foisted upon the British People, this Government: which the People, could not refuse. THERE MUST BE THE WAY FOUND IN ORDER TO CHALLENGE THIS FILTH AND CORRUPTION; FROM WITHIN LAW. Thanks for visiting and commenting. 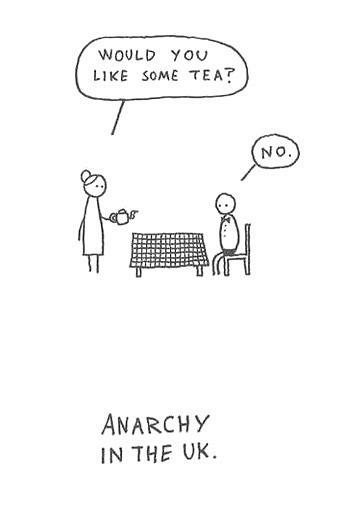 I am shocked with the anarchy in the UK taking place this weekend! It’s madness!! !